Opportunity Celebrates One Mars Year! Seemingly touched with a load of luck from the giddy-up, Opportunity has been galloping since she strutted off of her lander, some 670 sols ago. A mission planned for 90 days has turned into an adventure that's lasted nearly two Earth years! With over four miles on her odometer, Opportunity has returned over 58,000 images. The ground covered and the science transported back across the void of space has helped us see into our planetary neighbor's alluringly watery past. Like golfers on an extremely good day, rover navigators initially plopped Opportunity smack in the middle of a crater full of martian mystery and history – an interplanetary hole in one. "We could have landed in a place and roved for two months before we saw anything different, but nearly every day with Opportunity, we've encountered amazing complexity in the terrain," said Joy Crisp, Mars Exploration Rover project scientist. The main puzzle NASA intended the rovers to unravel was the story of water on the red planet. The first bedrock seen on Mars, bright and blatant in the very first pictures Opportunity sent home, marked the beginnings of an answer. Within just weeks of landing, excited scientists poured over pictures and data that clearly indicated the effects of water on layered rock, and the evidence just kept coming. Curious bead-like objects piqued scientists'interest at once. The beads, or "blueberries" as they came to be known, turned out to be rich int hematite, a mineral that often forms in water. 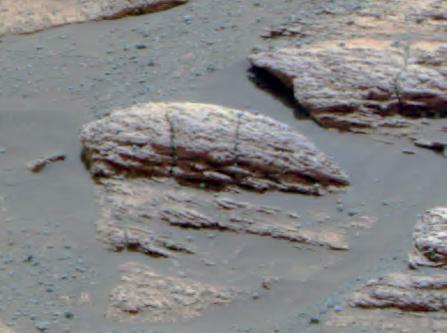 Distinct layering in some rocks (called "crossbedding") showed that water once flowed there on the surface of Mars, leaving ripple-like curves in the outcrop rocks. More recently, a rock was found in which the chemistry indicated the presence of sodium chloride (table salt), which only forms when water has been present. 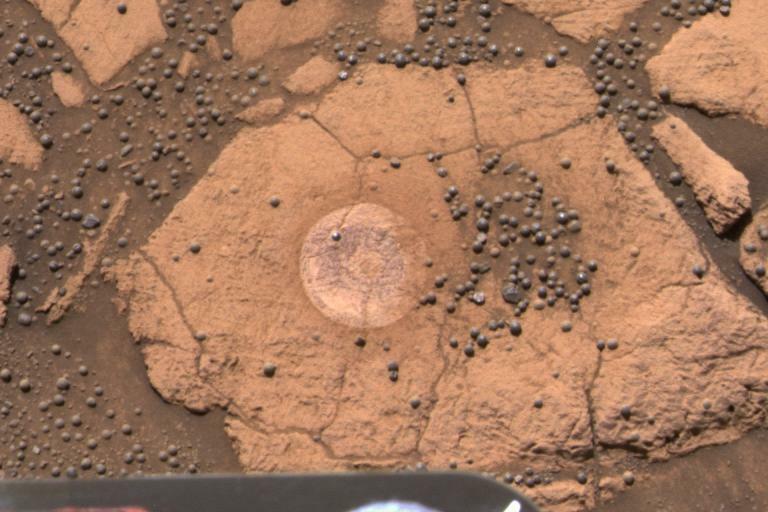 Like Goldilocks, searching for just the right bowl of hearty goodness, Opportunity tried craters of different sizes to find the most fruitful science results. Each of the major craters visited has been more satisfying than the last. As Opportunity explored progressively larger and deeper craters, more of the martian past was revealed, layer by layer. Her odyssey has shown that water was present not only once, but washed through and affected the area multiple times. "Signs of water are everywhere! The area was soaked, over and over. First, there was the water from which sulfate salt precipitated. Then, for the rocks at the top of craters, there was water that flowed along, transported and broke down pieces of rock, then deposited it layer by layer. Then, there was water that came and soaked the ground in perhaps several episodes," Crisp enthused. Some scientists wondered out loud, saying, "how good can this mission get?" Apparently, it gets pretty good for this lucky rover. For much of Opportunity's four-mile trek, it's been like driving in a parking lot, noted rover driver Scott Maxwell. However, trickier maneuvers have been necessary on some taxing terrain. On the way out of her first crater, Opportunity experienced slippage in the loose soil. Engineers were challenged to find a safer way out, and worked hard to find a successful exit route. That knowledge would come in handy later, when Opportunity reached the stadium-sized "Endurance Crater." The big question then loomed: risk Opportunity's demise by sending her into a crater she might not be able to exit? After grueling tests that pushed the design limits of rover surrogates on slopes back on Earth, engineers gave Opportunity the go-ahead to brave the downhill journey. After spending many months studying the crater's deep, complex rock layers, Opportunity climbed out intrepidly, and went on to investigate her own crashed heat shield (discarded shortly after entry through the martian atmosphere), discover a meteorite that once made its own fiery journey through the sky, and maneuver through bizarre "etched terrain."